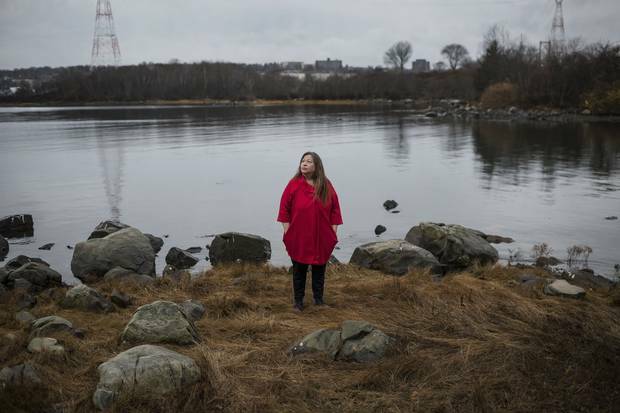 Cathy Martin of Millbrook First Nation stands on the shores opposite Halifax where Mi’kmaw families once lived at Kepe’kek, which means ‘at the narrows,’ until disaster struck in the Halifax Explosion 100 years ago. 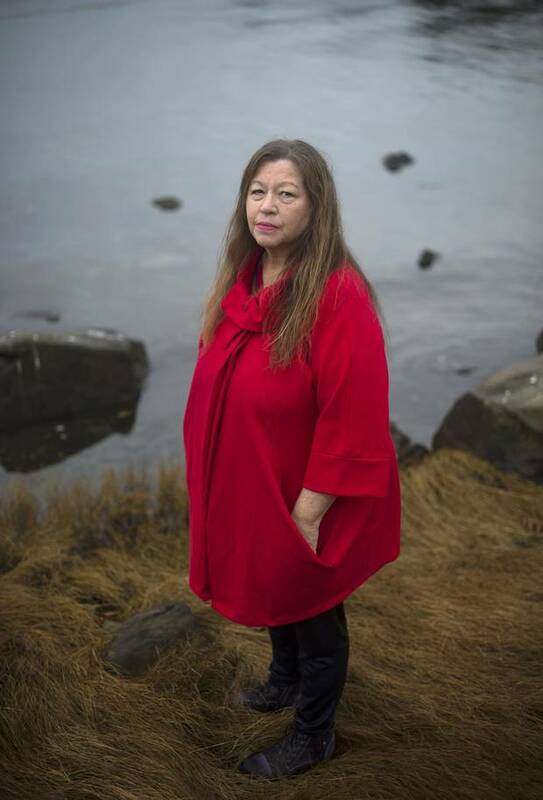 For the past decade, Cathy Martin has stood on the rocky shore of Dartmouth every Dec. 6 calling out the names of her Mi'kmaw ancestors as the bells toll at the official Halifax Explosion ceremony across the harbour. This year, she'll add seven more names to that list, as the mystery of what happened to her family a century ago is finally unravelling. "Their spirits are here. The more we say their names, the better they can rest and know that we haven't forgotten them," said Ms. Martin, age 59. "My great aunt Rachel Cope, my great grandma Sarah, and her little baby Annie, who was two. Leo, little Frankie, who was three – oh my God, I just imagine him. Little Henry … ." A century ago, at least 17 Indigenous families lived at Kepe'kek, (which means "at the narrows" in the Mi'kmaw language) and Maskwiekati Malpek (which directly translates to "Birchbark Cove" but some people call it Turtle Grove or Tuft's Cove). Many of those people were burned, crushed or swept out to sea in the Halifax Explosion. Their story has largely gone untold, lost among the deaths of 2,000 people and 9,000 injured. But soon, a set of notes following oral accounts from that fateful day will be cataloged at the Nova Scotia Archives. The documents shed new light on the lost community of Tuft's Cove – people whose stories have only ever been a footnote in history books about the Halifax Explosion. Before Ms. Yorke passed away, Mi'kmaw historian Don (Byrd) Awalt of Port Greville, N.S., copied the notes, and now his research, along with that of Mi'kmaw genealogist Kenny Prosper and Nova Scotia Archives senior archivist Garry Shutlack, paints a much clearer picture of what happened on the shores of Dartmouth. For Ms. Martin, the papers have connected her to ancestors she didn't know she had on her father's side. Previously, all she knew was that two of her relatives (her great uncle Henry Cope and his cousin Louis Cope) died in the explosion, and that her great grandfather and two great uncles served in the First World War. "Emotionally, it was overwhelming and the most information I ever had on the whole family, just on those four or five pages," she said. 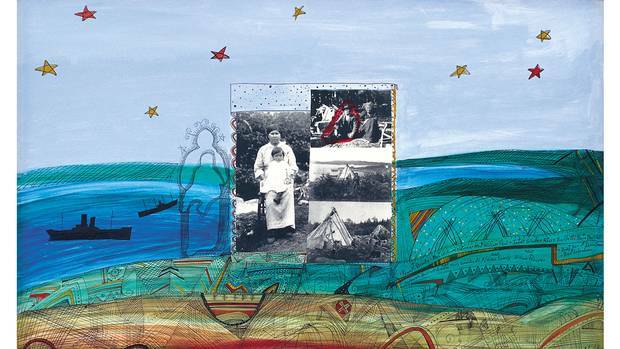 "The disconnect that happened as a result of the impact of the residential schools, of centralization, and the impact of colonization – we lost the strong oral history passed on through the language." 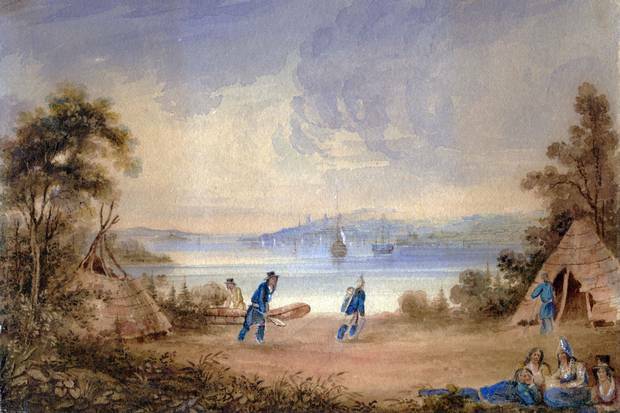 1837: A painting attributed to William Eager shows the Mi’kmaw encampment at Tuft’s Cove. 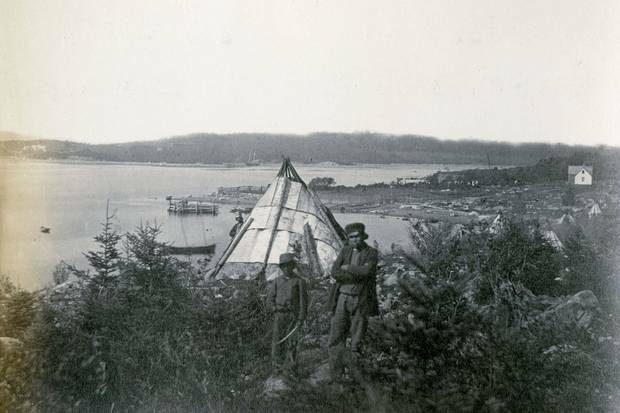 1871: A photograph by Joseph S. Rogers shows the Mi’kmaw at Tuft’s Cove. The community, ideal for Mi’kmaw because it was easily accessible by canoe from nearby waterways, was just a short boat ride across from what is now Halifax’s north end. 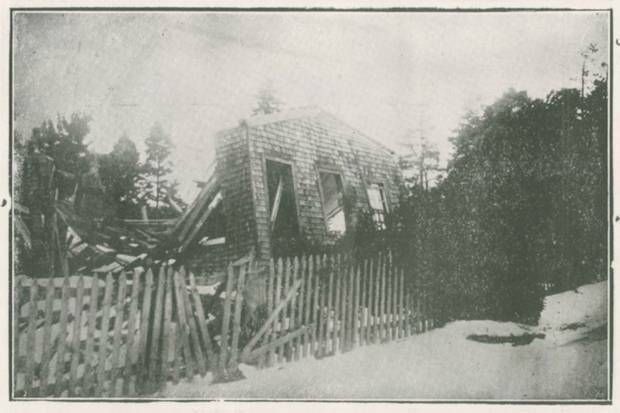 1917: The school at Tuft’s Cove lies in ruins after the Halifax Explosion. 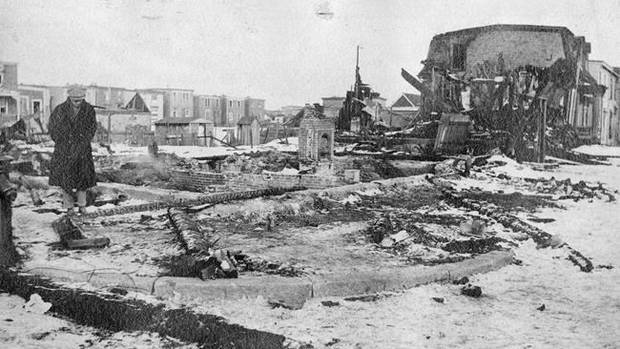 At the time of the explosion, there were at least 17 families living in the community. In 1999, Alan Syliboy of Millbrook First Nation painted Tuft’s Cove Survivor. Many descendants of victims and survivors of the Halifax Explosion now live at Millbrook. On Dec. 6, 1917, the community of Tuft's Cove, which at the time was on the outskirts of the city, was just a short boat ride across the narrowest part of the harbour to the town of Richmond, a bustling, working-class community now referred to as the North End of Halifax. The area was ideal because it was easy to access by canoe from nearby waterways, and close to the railway and markets for selling handmade goods such as baskets, beadwork, axe handles, hockey sticks and snowshoes. "Some of them would just be getting by," Mr. Awalt said. "Others were quite well to do and owned three to four properties." They lived in wigwams and framed houses. Starting in 1905, the federal government, under pressure from neighbouring property owners, began trying to evict Mi'kmaq from the shores of Dartmouth. Finally, after years of threats and just a month before the Halifax Explosion, the community got word that the Department of Indian Affairs had found them land in Albro Lake, close enough that they could continue their way of life. But this would be too late. Just before 9 a.m. on Dec. 6, 1917, the Mont Blanc, chock-full of explosives destined for the front lines of the First World War, struck the Imo, a Norwegian vessel, roughly 500 metres in front of the community at Tuft's Cove. As the manuscript goes, ten-year-old Rachel, was on her way to the Indian School with her brother and cousins when they noticed the burning ship. "For an instant the town of Richmond seemed to shimmer like a reflection in a still pond and then everything went black," Rachel recalled. When the Mont Blanc blew at 9:04 a.m., the force of the blast obliterated the north end of Halifax. The ship's half-tonne anchor landed more than four kilometres away. Ms. Martin says Rachel's father's cousins found her unconscious and seemingly near death. They laid her on a door that had been blown off its frame, and covered her in burlap bags. A priest and his sister arrived with a cartload of blankets and gave her a final blessing. "Fortunately, I was not aware of all this," Rachel told Ms. Yorke. "Not realizing I was expected to die, I failed to live up to expectations and kept on being." When Rachel came to, it was snowing and she was still wrapped in blankets on a door. Nothing was broken, but it hurt to move. Her ribs ached and breathing was excruciating. She remembered an elderly, grey-haired woman fed her chicken soup, talked and sang to her in Gaelic until she fell asleep again. When she woke up, her father's cousins were carrying her on the door. The men carried her in a snowstorm for 20 kilometres to Windsor Junction, without stopping to rest. Her 12-year-old brother Henry and 14-year-old cousin Louis had died in the blast. Her mother and younger siblings Frank, Leo, Mathilda, Mary (Ms. Martin's grandmother) and Annie were badly burned from fires that broke out from burning chunks of shrapnel that had rained down. Rachel's younger brother Frank, age three, was severely burned and in unbearable pain. He died three months later. Annie, age two, and her mother Sarah, 38, (Ms. Martin's great grandmother) both recovered from their burns, but died of the flu within a year. "There wasn't anybody helping them. I feel the horror and helplessness. … It just goes to the core of me," Ms. Martin said. "Now, I'm just so sad here because I can visualize the detail of what happened, how many people were screaming, children in the water – it was just such a trauma and it happened so fast." As the people carried their dead and injured to help, their "old time Indian wail" could be heard for over a mile, according to a 1919 Natal Day booklet by A.C. Pettipas quoted in Ground Zero, a history book about the explosion. The blast triggered a tsunami that swept six storeys high, washing many young Mi'kmaw children out to sea in front of their parents' eyes. Adults were hurled into trees by the tsunami that sounded like the "Fundy tidal bore during flood tide at full moon." By all accounts she did live a full life. She married a man from Beechville, had two children and four stepchildren, and lived in Truro, and on Maitland Street in Halifax. Ms. Martin hopes to connect with the families of Rachel's two biological children. Roger Lewis, an ethnology curator at the Nova Scotia Museum, says the manuscript helps fill in a Mi'kmaw historical narrative that was never recorded. "It was probably thought to be irrelevant and often ignored," said Mr. Lewis, who's a member of Sipekne'katik First Nation. "It's important that we accept that there are multiple chronologies of history in this province that are equally valuable." Incomplete government records have hindered the real story of what happened at Tuft's Cove. For example, the list of the dead found in the manuscripts is far more comprehensive than previous registers. Twenty-eight victims were verified on Rachel's list, while previously, government registers said there were just nine. "To be able to prove that there were this many members of the community that were affected by the explosion is significant because they were an important but small segment of the fabric of Halifax and Dartmouth," said Mr. Shutlack, the archivist. Today, many of descendants of victims and survivors live at Millbrook First Nation, a Mi'kmaw community about one hour's drive from Halifax. Millbrook Chief Bob Gloade says the land dispute that predates the explosion has been resolved. Canada Lands Company turned over 8.9 acres of land to Millbrook First Nation 15 years ago, and a plan is now under way with a local development firm to break ground next fall on a $200-million residential and commercial development for the site. "There is a historical connection to our community and it's something that's often been discussed with elders, so we want to ensure that we return back to the land where our ancestors and family members lived more than 100 years ago," Chief Gloade said. 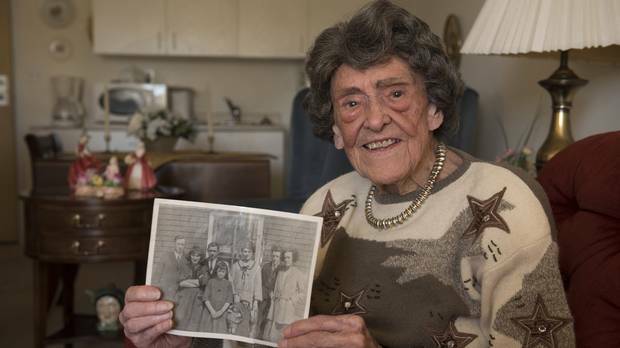 To commemorate 100 years since the Tuft's Cove community was lost in the Halifax Explosion, Ms. Martin will host a ceremony near Nootka Avenue in Dartmouth on Dec. 6, at 8:45 a.m. Meanwhile, she plans to keep digging into her past. "It's like a spruce root that you keep pulling and pulling, and I know I can follow that spruce root of hers and put more and more of the pieces together." 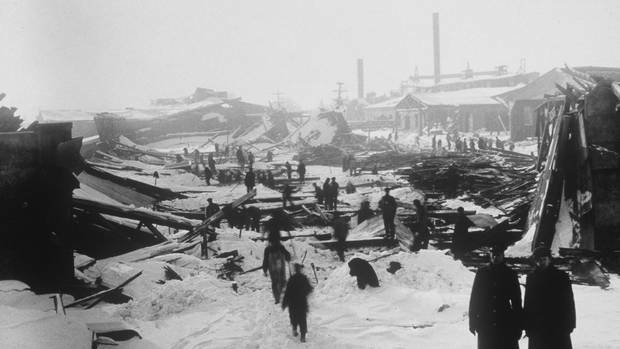 On the 100th anniversary of the Halifax explosion, two new books examine the disaster’s place in Canada’s mythology Ken Cuthbertson's The Halifax Explosion and John U. Bacon's The Great Halifax Explosion trace the reverberations of the deadly disaster. Read Dean Jobb's reviews of them. Kevin Quigley: 100 years after Halifax, are we safer from chemical explosions? The absence of independent public inquiries restricts opportunities for democratic oversight of the regulatory regime. The girl who lived: Remembering the Halifax explosion through a child’s eyes Kaye Chapman was five years old on the fateful day in 1917 when a munitions ship’s collision in Halifax’s harbour – only two kilometres from her house – blew the city apart. This is how she remembers it. Editor’s note: Rachel Cope's birthday and the street she lived on, as well as a translation of a Mi'kmaw word, have been clarified in an updated version of this story.